In this holiday workshop participants go on a journey to South-East Asia, and to Indonesia. 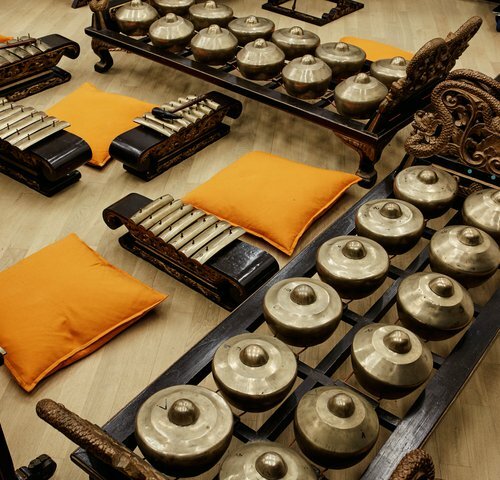 Like in all other nations on earth, the Indonesians love to tell stories and fairy-tales, and these are often given musical accompaniment on the gamelan, a centuries-old constellation of instruments that includes gongs, drums and bronze mallet instruments. In this workshop the participants make this tradition come alive in the Kaistudio. While one group practices simple pieces on the gamelan, a second group narrates the adventures of Kancil, a small but shrewd mouse-deer, on a large shadow stage. The week ends with a joint closing performance. The workshop takes place daily from 6-10 August 2018. Please note that only teenagers aged 12-16 may participate in this workshop.